On 3rd October, 1973 an important auction sale of three Warninglid houses took place in the Seaforth Hall. 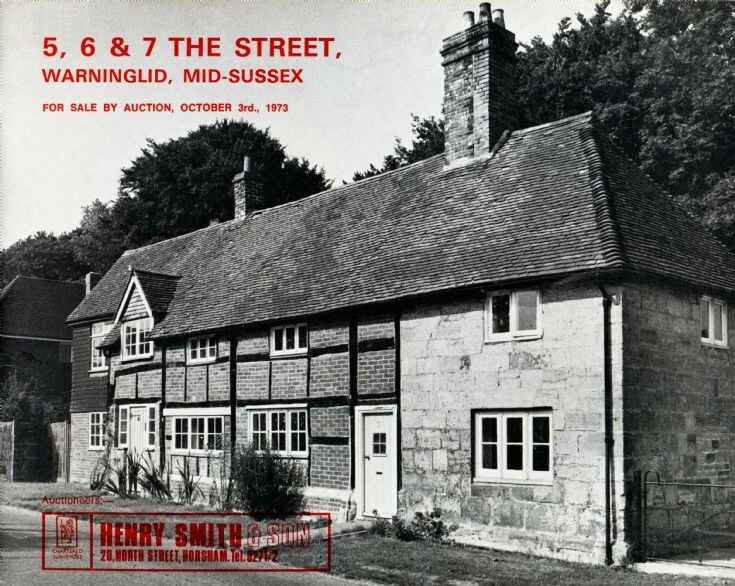 For sale were a pair of semi-detached cottages known as 5 and 6 The Street, and the adjacent detached house, 7 The Street. Above shows the front page of the catalogue, and the enclosed map can be found by selecting Large Version. According to the notes on the back page of the catalogue, number 5 sold for £16,000, number 6 was withdrawn at £18,500, and number 7 was sold for £23000. It seems that the latter price was reduced to £22,000 as the vendor wished to make a donation of £1000 to the purchaser, being the church authorities. northernmost window-bay refaced with ashlar. Hipped roof. Casement windows. One modern window-bay added at south end. Two storeys. Four windows. Select Open Document to view the contents of the catalogue.